What’s that? June is almost over, you say? Well, better late than never. Let’s get right to it, shall we? 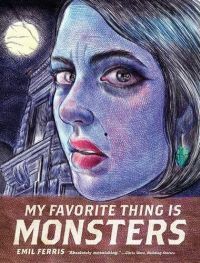 Emil Ferris is a writer, cartoonist, and designer, and appropriately enough, my recommended starting place for her work is her debut publication, My Favorite Thing is Monsters. First off, the book is eye-catching and gorgeous. It’s designed to look like a ruled notebook, illustrated and narrated by the main character, Karen Reyes. The story starts with a dream, Karen transforming into a werewolf and being hunted by an angry mob. When she wakes, her appearance doesn’t change; Karen sees herself as a werewolf. The mob is what frightens her, not the idea of becoming a “monster”, and that tells you much of what you need to know about Karen. From there, Ferris introduces the people in Karen’s life in an ever-widening circle: her mother, her brother Deeze, the neighbors in her building – Mr. and Mrs. Silverberg, Mr. and Mrs. Gronan, and Mr. Chugg and his ventriloquist dummies. The city of Chicago in the 1960s is a character, too, sometimes filthy, sometimes beautiful, but always teeming with life. When Karen’s upstairs neighbor, Anka Silverberg, is murdered, Karen sets out to solve the case, a werewolf detective on the prowl, hunting down clues and learning truths about herself and the people around her along the way. My Favorite Thing is Monsters is a massive book; its pages are jam-packed, but it never feels too crowded. It’s the kind of book that rewards re-reading, with nods and winks hidden within its pages, and bits of information dropped early that circle back later. Along with a story that grows in complexity, emotion, and darkness as new layers are added and peeled away to reveal its secret heart, the book is also a love letter. It’s a love letter to a city, to classic works of art, and to horror pulps and monster movies. Karen frequently sees the world around her in terms of artistic masterpieces, referencing everything from Peter Blume’s “The Rock” to Henry Fuseli’s “The Nightmare”. The sections of the book are divided up by Karen’s recreation of horror pulp magazine covers that pay homage to real world publications like Weird Tales, Horror Stories, and Spicy Detective. My Favorite Thing is Monsters also weaves in themes of friendship, family, growing up, race, gender, sexuality, love, loss, the ghosts of the past, and so much more. It’s a fantastic book, and I can’t wait to see what Ferris does next. 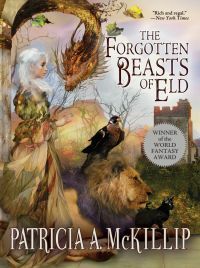 Next up, my recommended starting place for Patricia A. McKillip’s work is The Forgotten Beasts of Eld. McKillip is a master of the fantasy genre, a multiple award winner and nominee, and has a huge catalog of novels and short stories to recommend. However, I’m picking The Forgotten Beasts of Eld because it feels like the sort of book that has always existed, a timeless myth or fairy tale. The novel tells the story of Sybel, a powerful wizard who lives apart from society, surrounded by her magical animal companions. She needs nothing and no one, except for her ongoing quest for the Liralen, a mystical white bird. Her life is complicated when a soldier shows up at her gate carrying a baby, a royal heir who needs to be protected and hidden. At first Sybel refuses, but eventually she relents and comes to love Tamlorn. Despite her attempts to remove herself, and by extension Tamlorn, from the world at large, Sybel finds the world determined to encroach on her. There are factions fighting for power, making and breaking alliances around her, and it is impossible not to get caught up in their war. Those around her want to use her, Tamlorn, and her beasts for their own ends, seeing her as a prize, and a pawn in their game. What’s most striking about Sybel is that she’s allowed to be frightened and overcome at times, and cold and hard as iron at others. She is relentless when she needs to be, uncompromising and even cruel to those around her. She uses those who would use her, and never wavers from her purpose, even when it threatens to cost her those she loves. It’s a role usually denied to women, unless they are cast as utterly heartless “wicked queens”. But Sybel is complex – powerful and calculating, but never losing her ability to love; fiercely devoted to her family, but willing to put her goals above others; unapologetic for her choices, but longing to be accepted and forgiven. On top of a fascinating and rounded character in Sybel, McKillip also offers up gorgeous prose and a timeless fairy tale feel in The Forgotten Beasts of Eld, making this an excellent starting place for her work. 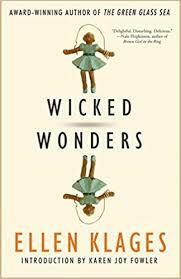 Last (for now), but not least, my recommended starting place for Ellen Klages’ work is Singing on a Star, a World Fantasy Award finalist originally appearing in Firebird Soaring, and included in her new collection, Wicked Wonders. In fact, it’s tempting to recommend the whole collection as a starting point, since many themes echo across the stories – childhood, friendship, loss, and magic. Singing on a Star encapsulates all of these themes, which is why I’m choosing it as my starting point. Becka is attending her first sleepover, staying at her friend Jamie’s house down the street. Upon arrival, Jamie puts on a record and drags Becka toward her closet, saying they have to go before the song ends so they can “see Hollis”. The closet becomes an elevator, transporting them to another world, one of neon and streetcars and somewhat seedy hotels. One of those hotels is the Farlingten, and that’s where Hollis works. He gives the girls money for candy bars, a kind Becka has never seen before, and takes them to the roof to watch the trains below. It’s electric and thrilling and a little bit scary. Becka feels out of her depth, lost, but enticed at the same time, and it’s over all too soon. Singing on a Star is reminiscent of Ray Bradbury’s stories, capturing that perfect point of childhood where the world is magical, and anything is possible, but with an underlying dread and darkness, as well. A sense of threat, of wrongness, hangs over the tale. Soon after their sleepover, Becka’s mother stops just short of telling Becka that Jamie has disappeared. Whether she’s vanished into the other world, or whether someone very real has taken her is left up to the reader to decide. Whatever Jamie’s fate, in all likeliness, it isn’t good. After all, every child knows bad things happen when you take candy from strangers. That’s it for this belated and somewhat shortened edition of Women to Read. As always, I hope you’ll leave your own recommendations in the comments, and I’ll be back with more suggestions of my own next month. Happy reading! This is a nice small list of books I can give as gifts.